Few sights can match the thrill of seeing a 30-ton animal explode from blue water, creating a wall of spray as the arching launch ends in a tumultuous reentry. 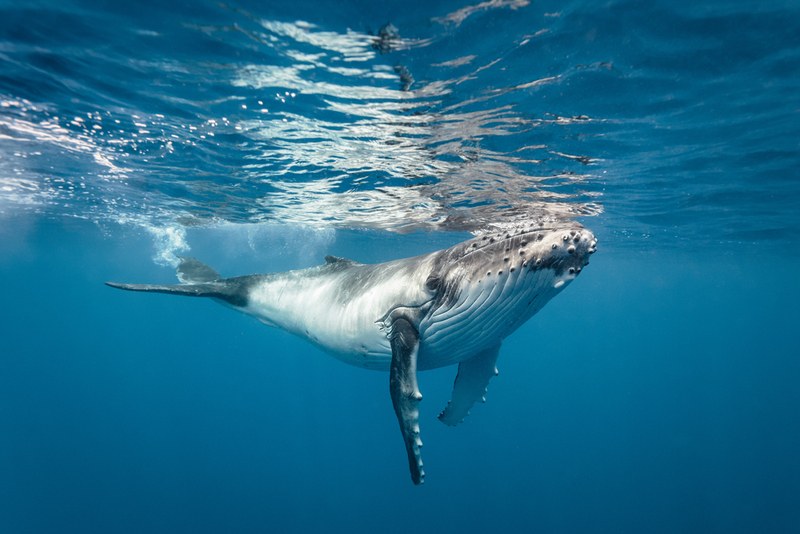 There are several places in the Caribbean where humpback whales perform these leaps, but only one where they are joined by their toothy cousin, the sperm whale. In fact, the island of Dominica is the only venue in the region where the hump-headed sperm whale can be found year round. It is often joined by numerous other species of whales and dolphins, earning this scenic island a reputation as the cetacean capital of the Caribbean. The steep hills on Dominica's west coast continue their precipitous downward slope underwater to create deep, sheltered bays. These coastal waters become feeding grounds for numerous varieties of whales and dolphins. Six species are seen on a regular basis, and another 16 types are encountered occasionally. Whale watching tours take place relatively close to the island. When booking a whale and dolphin watching excursion, choose a boat that is equipped with a hydrophone. This type of underwater microphone not only allows passengers to hear whales songs and the clicking communicators of dolphins, it helps the crew locate the animals, which increases the chances of a successful trip. Sperm whales can sometimes be seen from shore at points along Dominica's west and southwest coasts such as Scotts Head, Roseau and Layou. Boat trips originating from the Roseau area provide easy runs in calm water to prime areas where sperm whales can be seen on a year-round basis. A camera with a zoom or telephoto lens for up-close action shots of breaching whales and leaping dolphins. A compact backpack to keep your gear organized while on board. Polarized sunglasses to cut water glare and binoculars for a closer look. Waters are often calm, but those prone to motion sickness might want to bring medication. A valid passport is required with at least 1 blank page for entry stamp. No visa is required for stays of less than 6 months with proof of onward or return ticket. See the entry/exit requirements here. Vaccinations are not required for entering the Caribbean if you’re coming from the U.S. Before traveling check the CDC. 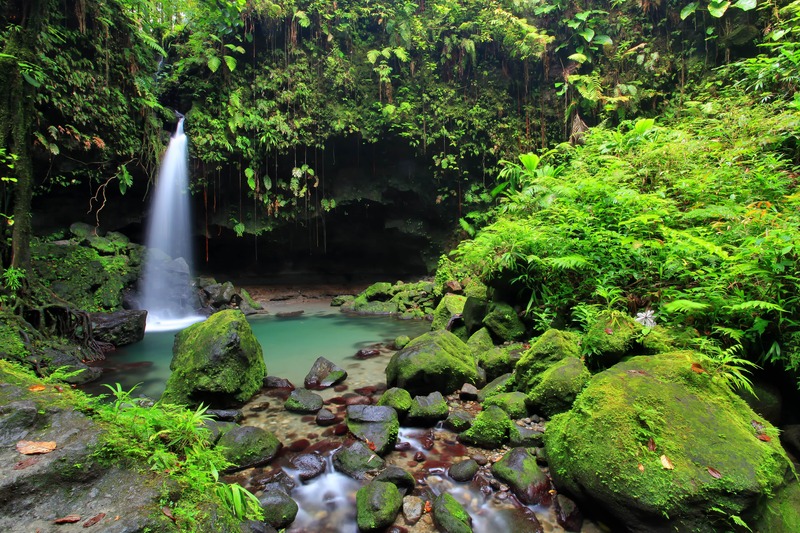 Dominica is known as "the Nature Island" for good reason. It is a land of unspoiled rainforests, volcanic hot springs, wild rivers and waterfalls. More than 60 percent of the island is covered in lush tropical vegetation and protected within three national parks, including the Morne Trois Piton National Park, which has been named a World Heritage Site. The mountainous landscape rises to almost 5,000 feet above sea level to harvest moisture from passing trade winds. Water is one of the island's most abundant natural resources, and more than 350 rivers gush out of the mountains to create dramatic gorges and spectacular waterfalls that spill into emerald pools. Among the most popular are Middleham, Victoria, Trafalgar and Sari Sari Falls. This landscape creates a mecca for the adventure traveler. Tours and activities range from kayaking, bird watching and hiking to jeep/ATV safaris and mountain bike treks. For the rugged hiker, there is the cross-island Waitukubuli Trail, or the climb to Boiling Lake, one of the world’s largest volcanically-active bodies of fresh water. With a glimpse of pre-Colombian culture, a visit to Carib Indian Territory provides a chance to interact with the largest remaining population of indigenous people in the Caribbean. For a take on the island's current culture, plan a visit during Carnival season, when calypso crooners and dance troops take to the streets. Dominica has earned a reputation as the whale watching capital of the Caribbean. Sperm whales can be seen in the waters of Dominica through the year, but prime viewing months are between November to March, when mothers arrive to nurse their calves. Other marine mammals often seen in the same area include pilot, pygmy, and false killer whales, plus spinner, spotted and bottlenose dolphin. The island operates on 220/240 volts - 50 cycles, so both adapters and transformers are necessary for U.S. made appliances. However, many hotels have dual 220/110 voltage, with 110V US style outlets in the room, along with 110 outlets available in the dive shops for camera equipment. Approximately 70% of Dominica’s electric power supply is hydro generated. Diesel generators provide the remainder. The island area code for Dominica is 767. There are 3 mobile service providers on the island, check with your local provider to see what plans are available or roaming charges will apply. Many hotels offer WiFi. Tap water is safe to drink, if you prefer bottled water, it is available for purchase. English is the official language though much of the local population speaks Creole (French based Patois). The Eastern Caribbean dollar (EC$ or XCD) is the currency used locally. Check the current exchange rate here. United States Dollars, British Pounds and the Euro are accepted. ATMs are available and dispense EC Dollars. Most vendors will accept foreign currency and give your change in local currency. Credit cards are widely accepted. Dominica is on Atlantic Standard Time and does not observe Daylight Savings Time. Dominica is 4 hours behind Greenwich Mean Time (-4 GMT). Dominica is a sovereign island country that is part of the Windward Islands in the Lesser Antilles in the Caribbean. It is located SSE of Guadeloupe Islands and Northwest of Martinique. Dominica is 289 square miles, roughly 29 miles long and 16 miles wide at it's widest point. Dominica's population is 73,016 (2016).